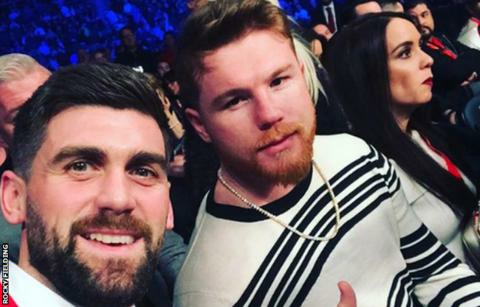 Late last year, finding himself alongside boxing legend Saul ‘Canelo’ Alvarez at an event in Belfast, British fighter Rocky Fielding took the opportunity to grab a selfie with the Mexican great. A few months later, while on holiday in Alvarez’s homeland, Fielding was able to wow the locals with his snap of himself alongside their national hero. One man was taken aback enough to offer Fielding his car for the day, allowing him to take his young son Ralphi to a water park. Scroll forward a few more months and Fielding – brought up in one of Britain’s most deprived areas – now fights 28-year-old Alvarez – the highest paid man in boxing with Floyd Mayweather having retired – at New York’s Madison Square Garden in New York on Saturday. It is a landmark night in the career of a 31-year-old who caught a double-decker bus home to Stockbridge Village in Merseyside with his handful of supporters after a debut fight at Salford Sports Centre eight years ago. Fielding has just gone through a light workout in front of BBC Sport in Manchester. The altitude chamber in which he is training simulates 2,700m, and his chest rises and falls dramatically as the sweat drips to the floor. Fielding’s mind is now firmly on boxing. Just three years ago he struggled to focus on his sport while supporting his mum through cancer. She told him about her illness just days after his first career loss, to fellow Liverpudlian Callum Smith. “I knew something had been building up but she said she didn’t want to distract me,” Fielding reflects. Granddad passed away, but mum came through and she was sitting in the Baden-Arena in Offenburg, Germany, when her son won a version of the WBA world super-middleweight title in July. Well, not quite when he won. “She likes being there in the atmosphere with everyone but when I fight she leaves the arena,” says Fielding. Three months later, Fielding was in bed while his partner fed their newborn daughter Romi. His trainer Jamie Moore phoned him. “I asked what weight and when he said my weight – super-middleweight – I said ‘sound, let’s do it’. In fact, Moore had been holding back on the news for a few days, having resolved not to tell his fighter until the deal was done. Much of the boxing world was as shocked as Fielding, with Alvarez moving up a weight division fresh from signing a £278m five-year fight deal to make him boxing’s highest-paid athlete. Tweets that Fielding could not understand flooded in from Mexico, television channels suddenly wanted interviews by the bucket load and for the first time his next-door neighbour on the estate he had recently moved to began asking who he was. A global media tour even saw him ring the bell to open the New York Stock Exchange for business, following in the footsteps of Nelson Mandela, Bill Gates and Mickey Mouse among others. “I looked at the itinerary for the media week and the Wednesday said ‘ring bell’ and something else. I didn’t have a clue what it was,” admits Fielding. Alvarez – one of seven brothers to fight professionally – is 1-20 with bookmakers. Should Fielding upset the two-weight world champion, the result would register in parts of the world a long way from Stockbridge Village – formerly known as Cantril Farm. The area where Fielding played four football matches each weekend as a child sits in the borough of Knowsley, one of the most deprived areas in the UK according to government statistics released in 2015. Fielding acknowledges it “wasn’t the best of areas” but is proud of his childhood neighbourhood. ‘Rocky from Stocky’ has become something of a cult figure in Liverpool and when he moved to the outskirts of the city he became so waylaid by selfie requests from fans on simple trips to the supermarket that it took an age to buy a loaf of bread. He says if he coached kids in the area now, the fighter he would tell them to watch is Alvarez, although true to his roots his own heroes were local. Former British champion Tony Willis, and Peter Culshaw – a Commonwealth flyweight champion who won WBU and WBF world belts – inspired the young Fielding at Stockbridge Boxing Club, so much so he would miss morning school to watch them work out. “When I’d be in the gym Peter was going to Tenerife to train so I was like wow, he’s going abroad for a training camp,” Fielding recalls. “As the years went on I got in the ring with him for a move around and he caught me with a body shot. He boxed at eight stone, I was about 14 stone and I’ve never felt pain like it. Salford, haters and boxing stardom? Fielding took up boxing when his dad decided to get fit and visit the local boxing club. He enjoyed the buzz and has developed a knack for taking opportunities. He entered a Prizefighter tournament at five days’ notice in 2011 and won, while his last win saw him overcome the unbeaten German Tyron Zeuge at five weeks’ notice to win the WBA ‘regular’ world super-middleweight title. Alvarez still holds two world titles a weight division lower and represents a test unlike any the Briton has faced before. But Fielding gives short shrift to those who write him off. He says: “This is what I want to do in my life, I am putting everything into it, so how can people give me stick? I’ve had a few horrible messages on social media. How can you say that? I have been in this game since I was nine. I’ve had a lot of setbacks, ups and downs. “People are saying I am selling my belt or I’ve lost before I fight. No, I am not selling anything – I accepted the fight before knowing the money. “I also have my family, my boy and my newborn girl, so these things are for them, these are the reasons I miss the nursery runs, the weekend outings as a family, the night feeds. “I turned professional with no promoter. My first fight was in a sport centre with 500 people. I got on the double-decker bus home with most of them. To now fight in Madison Square Garden as a world champion is unbelievable. A global platform awaits. The selfie requests would soar.